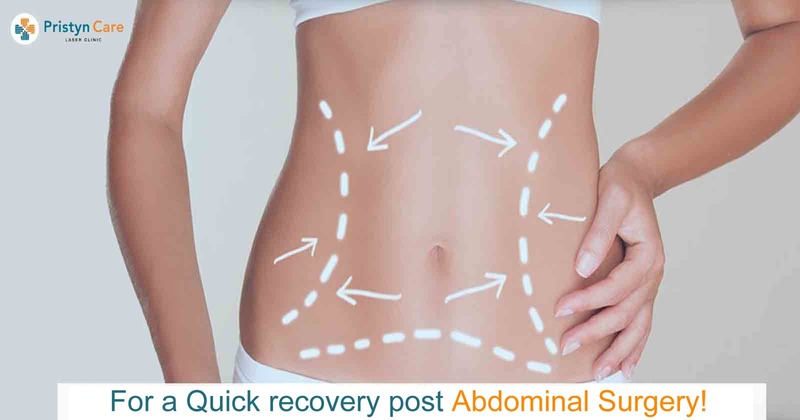 Abdominal surgery indicates the surgical treatment on abdominal organs which includes stomach, small intestine, large intestine, gallbladder, appendix, liver, pancreas, spleen, and esophagus. Millions of people undergo abdominal surgery to overcome various disorders in the abdominal region. Healthy recovery from a surgery needs special care. It not only fastens up the recovery process but also prevents complications and uncomfort. Walk a few steps:Taking a few steps every day while recovering from abdominal surgery can help pump more oxygen to the lungs reducing the risk of pneumonia which is a common risk after abdominal surgery. It also facilitates blood supply and lowers the chance of having blood clots. Try avoiding pain killers:Generally, doctors recommend a pain killer or an epidural injection to protect bowel function. However, you must try not to depend on these drugs and reduce its intake as they can slow down the intestinal function leading to constipation. It can increase recovery time. Increase the intake of fluids:Drink a lot of water and other liquids once your doctor allows you. You may also have coffee sometimes but don't miss water to avoid dehydration from caffeine. Chew gum:Chew gums can imitate that you are eating resulting the digestive system to function well. Abdominal surgery often slows down the digestive system. Use rocking chairs:It is better to sit than lying for a better recovery as sitting tends to open the lungs. A rocking chair engages you in additional activity benefiting your body.